The vast majority of these wines are served as dessert wines, but some are also used in cooking (Marsala), as aperitif, between-meal (brachetto d’Acqui) or to accompany a cheese platter or foie gras (Passito di Pantelleria). The main difference between Passito wines and other dessert wines is that Passito wines are obtained by using late harvest grapes, which went through a drying process, either naturally (i.e. by leaving the grapes “raisining” on the vine) or on external supports (for example on straw mats), or a combination of the two. Passito wines are sweet and very rich in alcohol. Grapes drying on straw mats. The drying process – called “appassimento” – generally lasts between 3 to 4 months during which the sugar reaches a level of 30%-40%. Then the wine is generally put into oak barils where it rests for 3 to 5 years. Typical sweet wines served as digestifs are vinsanto or other passito wines, such as Sciachetrà from Cinque Terre and Passito di Pantelleria. Some of these wines, such as the Passito di Pantelleria are also an excellent match with foie gras and herbed cheeses. 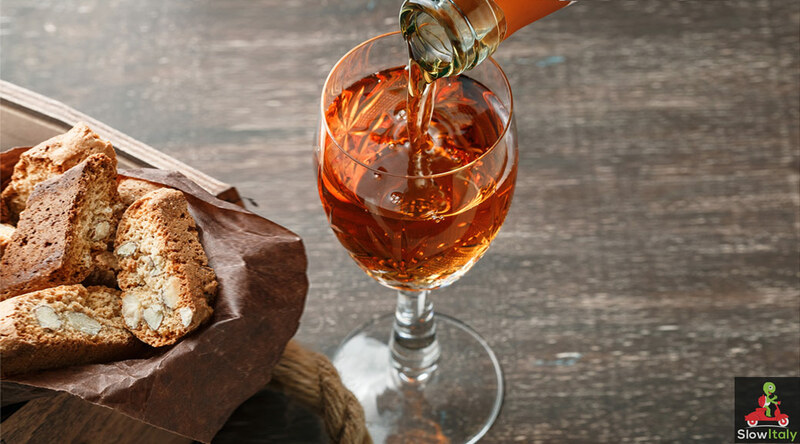 Vinsanto is a sweet (white or red) wine from Tuscany and Umbria, made with Trebbiano and Malvasia grapes. When it is made with Sangiovese grapes it is called vinsanto occhio di pernice. 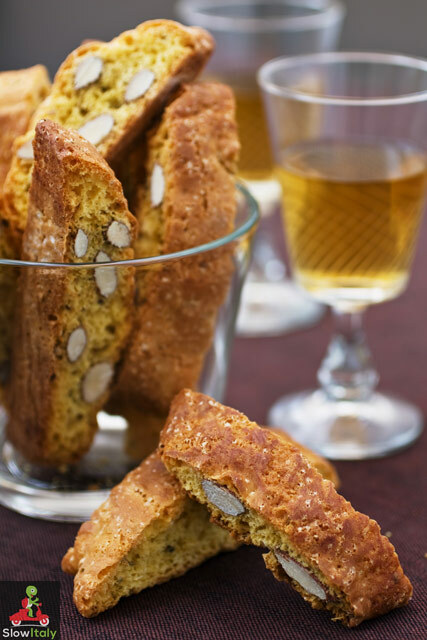 Although it is usually consumed with Cantucci (almond biscuits) dunked in the wine, some producers make Vinsanto wines that compare well with the more delicate sweet and syrupy wines from other countries. Vinsanto exists in four versions: secco, amabile, occhio di pernice, and riserva. Passito di Pantelleria is made on the island of Pantelleria (situated halfway between Sicily and Tunesia), from moscato d’alessandria grapes, a variety of the ancient muscat grape known as Zibibbo (from the arab zabib, “fruit withered under the sun”). It is a very fine, sweet dessert wine. Loazzolo is a rare, straw-yellow colored passito wine with an intense fruity bouquet and flavors of rose and violet petals, melon and minth. Sciacchetra is a rare, sweet and delicate, white wine from Cinque Terre, Liguria, yellow gold in color with intense amber reflections and elegant flavors of apricot and acacia honey. Ideal with pastries, desserts and Panettone. 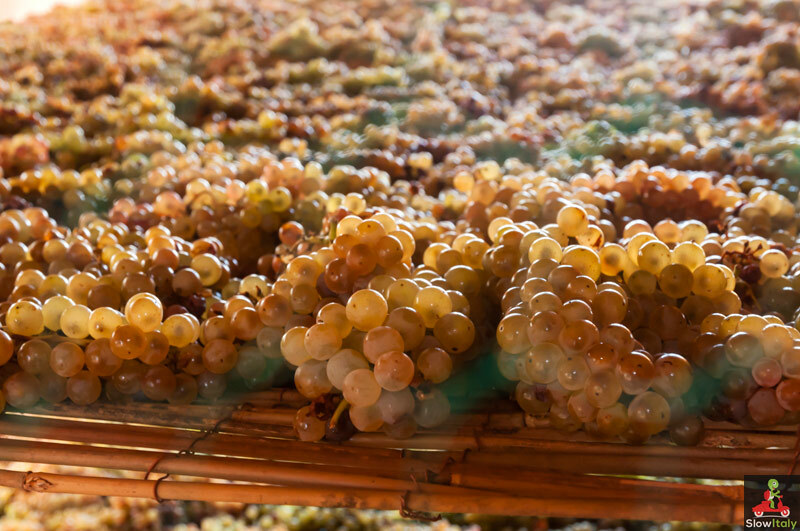 The syrupy (or liquorous) wines are instead obtained from aromatic grapes (Moscato, Malvasia, Aleatico….) to which alcohol or concentrated “mosto” is added. 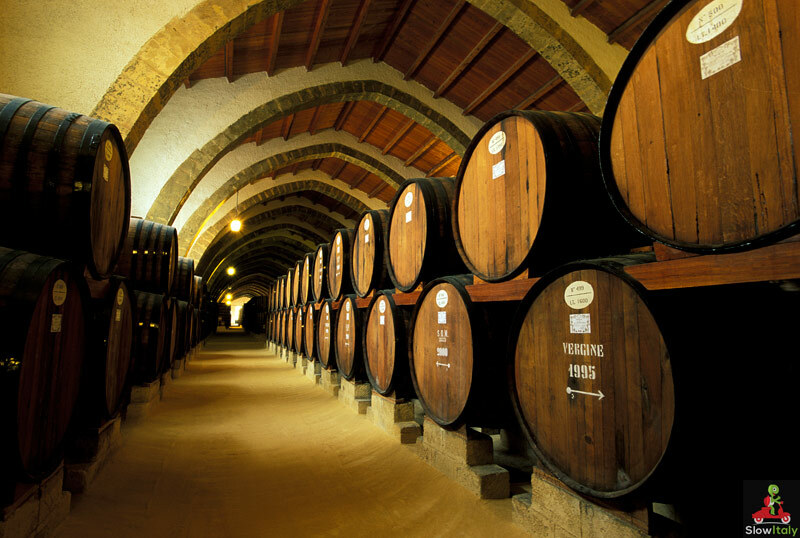 Marsala is produced in the city of Marsala (anciently Marshalla) in Sicily. It can be consumed as a dessert wine, but traditionally it was served as an aperitif. It is also used in the preparation of desserts like cakes and Tiramisù. Marsala is brown or amber colored with a strong, typical aroma and comes in four categories of Marsala: fine, superiore, vergine and vergine stravecchio. Moscato di Pantelleria made from moscato grapes. Vernaccia di Oristano is a sweet DOC wine from Sardinia with a Xeres-like taste. There is also a dry variety with the same name. Malvasia delle Lipari is made from malvasia grapes on the island of Lipari. The sweet sparkling wines mentioned on this page are obtained by artificially halting the fermentation process by chilling the fermenting juice. As a result part of the original sweetness is retained in the wine. Brachetto d’Acqui, a delicious, red, sparkling wine with flavors of rose petals and strawberries. To obtain the typical aromatic taste, fermentation is interrupted at an alcohol content of 5 percent alcohol by volume. It is produced with black grapes of the same name (brachetto). It is probably one of the only DOCG wines named after a grape variety instead of a geographical area. Also exists as still dessert wine. Moscato d’Asti, a sweet semi-sparkling wine made from moscato bianco grapes. As compared to Asti spumante it has a higher concentration of residual sugar and lower alcohol and carbon dioxide content. Ideal with fruit based desserts. Moscadello di Montalcino a straw-yellow sparkling dessert wine, already described in the 17th C. as a divine and light wine (“Quel si divino e leggiardetto moscadelletto di Montalcino”) by the Italian physician and poet Francesco Redi in his dithyramb “Bacco in Toscana”. Exists as Tranquillo (still dessert wine), Frizzante (sparkling dessert wine) and Vendemmia Tardiva (passito). Photo credits: all photos © Slow Italy, except (from top to bottom), featured image © AnSyvanych; Marsala wine cellar © pacaypalla; grapes drying on straw mats © Mmaxmax; Vinsanto © ninette_luz.